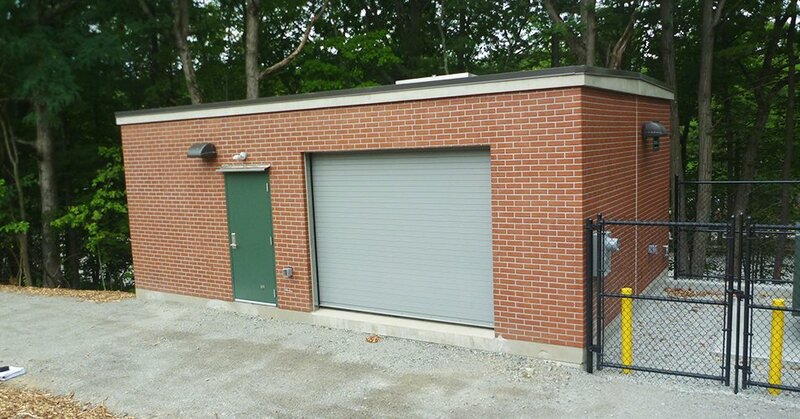 Working with the DCR, CDR Maguire provided engineering, permitting and construction administration services for a new pump house at the Blue Hills Ski Area located on the western face of Great Blue Hill in Canton, Massachusetts. Privately-operated, the ski area lies within the state-owned, 7,000-acre Blue Hills Reservation. The ski area requires an abundant water source for snow protection to supplement natural snowfall and maintain ski conditions through the variable metro Boston winter season. Because of their expensive water source and outdated equipment, DCR agreed to assist the Ski Area in obtaining a new source of water and building a new pump house. Working closely with the owners, town officials and DCR, CDR Maguire designed a new 12-inch water main to connect the new pump house to the Town of Milton water system. CDR Maguire then designed the pump house that consisted of a prefabricated concrete building to house pumps and controls. The pumps consist of two, 400 horsepower pumps located in protected open space with national historic significance; the pump house required context sensitive design to limit impacts to natural and cultural resources. CDR Maguire also presented a Request for Determination of Applicability to the Milton Conservation Commission who allowed the project to proceed without filing a Notice of Intent. Finally, CDR Maguire provided construction administration services including, shop drawing review, addressing contractor’s requests for information, review of payment requests, site visits and start-up services. The project was completed in the summer of 2016 in time to produce snow for the 2016/2017 ski season.